I took a deep breath and opened the washing machine and smiled broadly…no reds or blacks ran onto the white! Woohoo!!!! 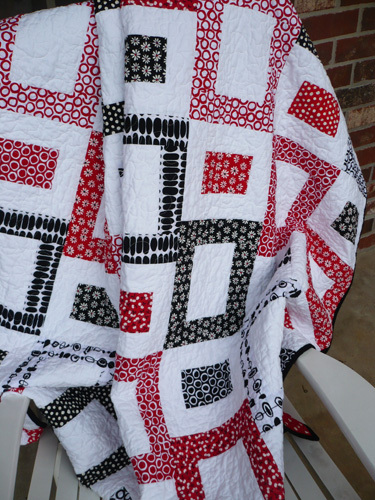 Here’s a little background on the quilt’s name. My son swims competitively for the AquaHawgs, and my daughter will also swim on the team this fall. The reason we are a part of the AquaHawgs is because of Coach Amy. We all adore her, and she really ignited the swimming passion in both of my kiddos. If not for her we likely would not be a part of the AquaHawgs. So with her departure comes lots of sadness, but also true excitement for her and her husband as their life’s journey takes them elsewhere. Our family has truly been blessed to have had Coach Amy involved in our lives for the last 2 years. 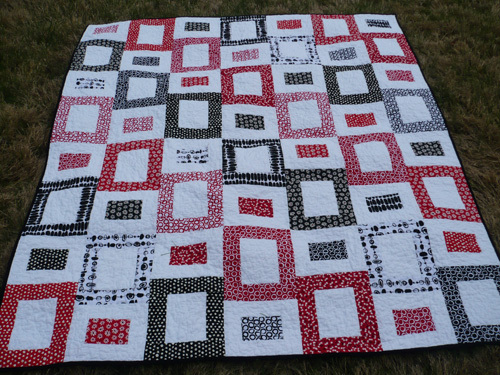 When she told me she was moving, I of course knew I needed to make her a quilt to thank her for everything she’s done for us. 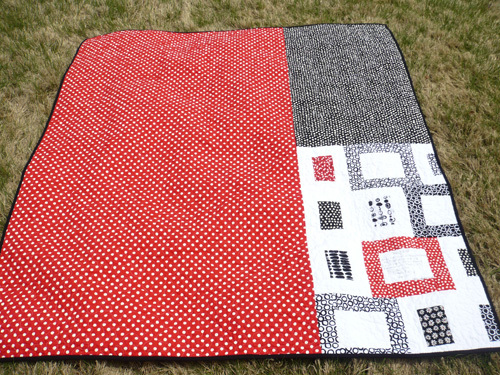 Since the team’s colors are red, black, and white, I thought a quilt with those colors would be perfect. Wherever she is she can wrap herself in some AquaHawg love and some Chriss family love. 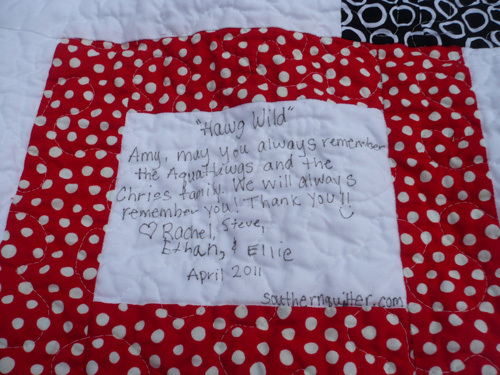 For the quilt’s label, I had all 4 of us sign our names…for an extra special touch. We love Coach Amy so much, and we are going to miss her! Post wash measurement is 56.5 x 63.5. 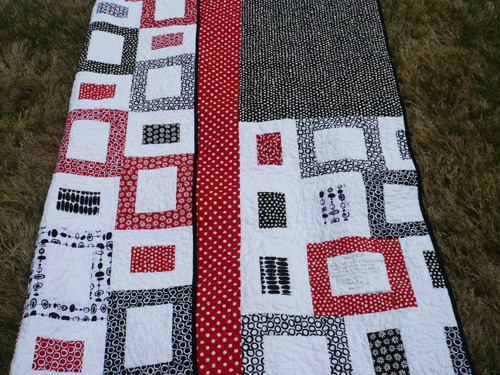 The pattern is Quilted Windows, and I modified the pattern a bit to make the quilt wider. 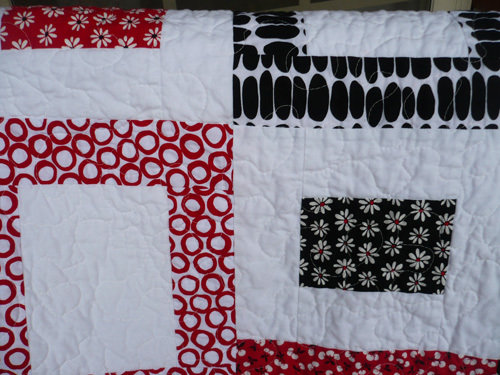 The fabrics are mostly Mingle by Monaluna for Robert Kaufman. 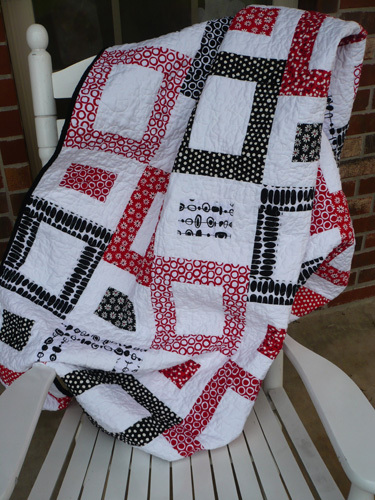 I absolutely love how this quilt turned out. I’ve had this post sitting as a draft for nearly a week, because I didn’t want to post it until I gave Coach Amy her gift. We are bringing her gift to her today…hope she loves it! Back…I love a polka dot back! 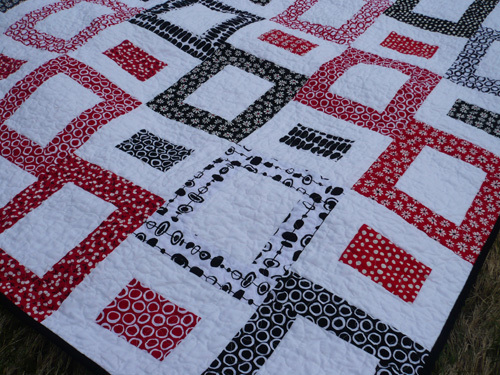 The quilt label. 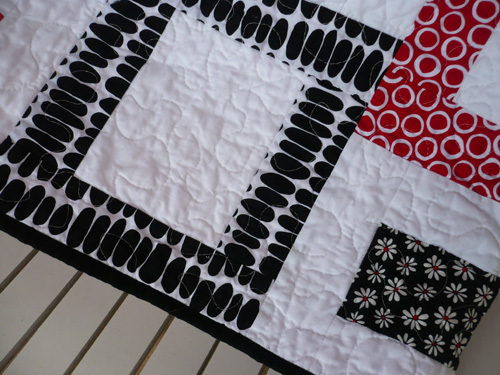 I incorporated it into the pieced blocks of the backing.